Robotic-assisted surgery is used for carrying out either partial knee replacements or total knee replacements. This is for patients who have severe arthritis in their knees, meaning the knee is essentially worn out, causing pain and stiffness all of the time. If only part of the knee is worn out, then we only need to replace part of the knee. A surgical robot can be used in order to implant a partial knee replacement in the absolute perfect position to make somebody’s knee feel really natural and normal following surgery, allowing them to get back to a good quality of life and enjoying all of the things that they want to. Robotic-assisted surgery can also be used for a total knee replacement. This is where all of the knee is replaced rather than just one damaged part and it’s for patients whose disease is somewhat more severe or in more than one part of the knee. Unfortunately, even the best total knee replacements aren’t as good as partial knee replacements, but again by using robotic surgery and getting the new knee in exactly the right position, we can improve the outcomes and give people a better end result. What is the process for robotic-assisted knee surgery? The whole process for robotic-assisted knee surgery will begin with a visit to the orthopaedic surgeon to describe the problems with the knee, and to have an assessment of the knee. This will probably involve taking some x-rays to make the diagnosis and to see which parts of the knee are damaged, and then make a decision as to what intervention is required. If that intervention is a knee replacement of some sort, then the doctor will have a discussion whether conventional surgery or robotic-assisted knee surgery is the best option. If a decision is made to go down the route of robotic-assisted knee surgery, then the next step is to get a pre-operative CT scan of the knee. This gives us enough information to make a 3D computer model of the knee so we know the exact shape of the patient’s knee. We then upload that model to the robot, where it is used during the surgical procedure. On the day of the surgery, the robot will already have all of the information about the shape of the patient’s knee. We already have the good idea of the size of the implant that’s required and the exact position of the implant. During the surgery itself, some special markers are attached to the patient’s leg, and different regions of the patient’s body are defined so that the robot knows the shape of the knee, but also knows where the knee is within the operating theatre. This allows the surgeon to start using the robot to make the surgical resections of bone, or trimming away the diseased parts of bone during the operation. Once the robot has been told where the knee is, and knows the shape of the knee, the surgery can start. The surgery for a conventional knee replacement involves using a saw to cut off surfaces of bone, but with the robot, a rotary burr is used to take off the bare minimum of bone and to shape the patient’s bone perfectly for the implant. Measurements are taken before the surgery, during the surgery, and after the surgery with the robot to ensure that an absolute perfect result is achieved according to the plan. The benefits of using the surgical robot for knee replacement surgery really centre around improving patient outcomes. The satisfaction rates of conventional knee surgery are about 80-90%, and this can be increased with robotic-assisted surgery. Part of the reason that patients may feel dissatisfied is that the knee is a complicated joint with complicated shapes, but newer implant designs are beginning to mimic these very well. 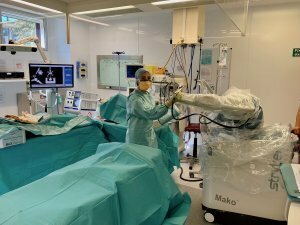 Another problem is getting the new knee perfectly implanted into the patient in exactly the right position, this is where robotic-assisted knee surgery comes into its own. Essentially, what the robot does is exclude human error from the procedure so that a perfect result can be achieved every time and therefore, hopefully drive up the satisfaction rates and make patient’s knees feel a whole lot better. Click HERE to see a short video about it, and HERE to see more video. Don't worry there si no live surgery!